Shortly after his June meeting with Kim Jong-un in Singapore, President Trump declared victory in his mission to rid North Korea of nuclear weapons. Shockingly, that boast may have been just a bit on the premature side. In a report released Monday night, the International Atomic Energy Agency said that it found no evidence that the hermit kingdom had ceased any of its nuclear production at all. “The continuation and further development of the DPRK’s nuclear program and related statements by the DPRK are a cause for grave concern,” the report read. The agency, which reports to the United Nations, warned that it only had limited knowledge of the country’s nuclear activities, since international inspectors have not been given access to key sites. 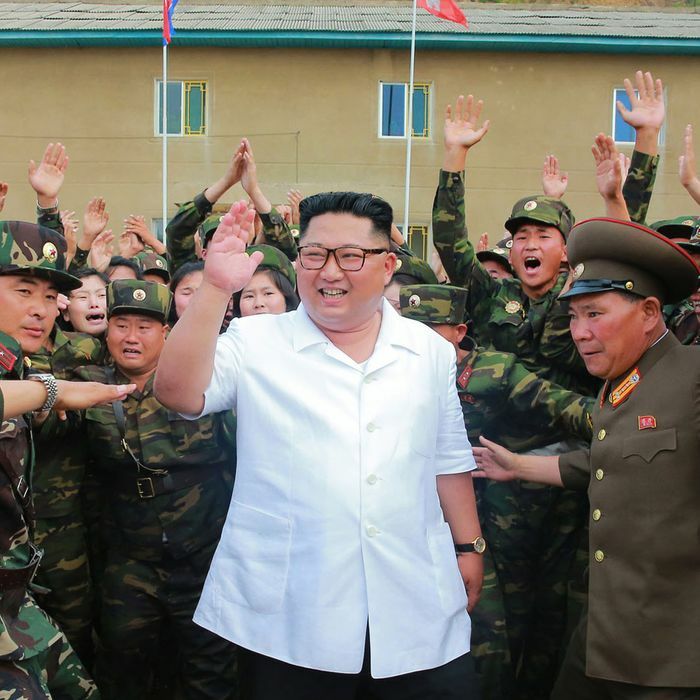 The report comes on the heels of similar, ominous signs over the last two months that North Korea is not exactly going all-in on pacifism in the wake of the Singapore summit. Monday’s news is particularly alarming, though, because the country vowed to suspend the country’s nuclear developments indefinitely back in April. None of this is likely to come as a surprise to the chorus of foreign-policy voices who predicted from the beginning that Trump’s plan to achieve a North Korea breakthrough – which consisted of threatening nuclear war, then agreeing to a meeting and hoping that the pair’s personal chemistry would overcome any other obstacle – was not very well thought out. Trump and Kim’s Singapore meeting produced only a vague commitment to peace, and was not undergirded by any of the traditional diplomacy that typically goes into such negotiations. (Like, oh, the Iran Deal, which President Trump gleefully ripped up despite its efficacy.) North Korea has an extensive history of promising to denuclearize and then promptly going back on its word. And, as many have pointed out, it makes little strategic sense for North Korea to give up its nuclear weapons, which constitute its main source of international leverage — especially since the U.S. won’t ease punishing sanctions first. In an interview with Reuters Monday, Trump insisted that “many good things are happening” with North Korea, and said he would likely meet with Kim again. Perhaps they can discuss the biggest outstanding question: Where’s Trump’s Nobel Peace Prize?